The attractions of the sport of horse racing are many and varied. For some it is the spectacle of man and beast striving for sporting greatness. Form students revel in the mental entertainment of trying to solve racing’s never ending puzzle. For still others a day at the races represents a unique social occasion. Then of course there are the trainers, jockeys and stable staff whose livelihood depends upon this great sport. Gambling has been associated with horse racing almost since the sport began and it continues to enhance the inherent excitement of racing to this day. Let us take a brief walk through time and follow horse racing’s journey from ancient times to the present day. Horse racing is one of the oldest sports which retains its popularity to this day. So old in fact that even the Gods are said to have participated! The Norse god Odin and his great rival, the giant Hrungnir, are said to have pitted their mounts Sleipnir and Gullfaxi against each other in a race. Odin was so confident Sleipnir would win that he staked his own head on such an outcome. Sleipnir won and Odin kept his head. 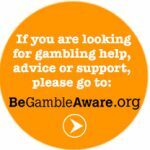 We advise more responsible gambling and only betting what you can afford to lose! It is not only Norse mythology which contains early tales of the sport. Archaeological findings have provided evidence of horse racing amongst the ancient Egyptians, Babylonians and Syrians. In these cases we can’t be sure exactly what form these races took. The ancient Greeks, however, paint a more detailed picture. The Greeks were one of the earliest civilisations to truly embrace sport. Games were regularly held as long ago as 700BC, with the most famous of course being at Olympia. Horse racing in various forms was one of the primary attractions of these games. Chariot racing featured prominently but so did races featuring men on horseback. Much like today, horse ownership was primarily a pursuit of the wealthy, with the owners being awarded the lion’s share of the prizes. Another of history’s great civilisations, the Romans, were to carry this tradition of horse racing through the ages. Chariot racing maintained its popularity and indeed lives on to current times in the form of trotting racing. The Romans can also be credited with two innovations which have endured to this day. They were the first to use starting stalls and the owners of the time were the first to create their own recognisable colours. The earliest jockeys’ silks if you like. It was the Roman armies who first brought horse racing to Britain with early events held at York and Chester. The stock of British horses at this time was primarily of Scottish and Irish descent in the form of the Galloway and Hobble breeds. The sport continued to develop despite lacking much in the way of organisation. It would take the influence of royalty to provide racing with some form of shape and structure. It was in the seventeenth century, under King James I that the sport really began to take shape. His love of horses led to him establishing a hunting lodge at Newmarket which later became the headquarters of British flat racing. It was also during the times of the Tudors and Stuarts that Arabian horses began to be imported for breeding purposes and the Royal Stud was created. Development was briefly interrupted by Oliver Cromwell, who banned the sport, but King Charles II soon took up the reigns. A lover of all things equine, King Charles II owned and rode his own horses and created the round course at Newmarket. He also employed the first royal trainer, one Tregonwell Frampton, who held this post under five separate monarchs. Racing at this time was primarily match racing between 2 horses over distances of up to two miles. Horse racing soon grew in popularity amongst the masses and by 1740 its influence was deemed to be so great that an act was passed aimed at restricting racing for the good of the country. Its popularity was now so widespread that it could no longer be supported by royal patronage alone. The Jockey Club was set up in 1751 to assist with the running of the sport. Its model has set the template for horse racing in much of the world today. The next influential figure was Admiral Rous who helped in establishing an early racing calendar. He moved the sport away from match racing and organised handicap races, pitting horses of varying abilities over a much broader range of distances. The first handicap was run at Ascot in 1791. The classics were also established at around this time with the first Derby being run in 1780. The first on-course bookmaker also made an appearance in this era when a gentleman by the name of Ogden first set up his pitch at Newmarket in 1795. That man has a lot to answer for! The growth of racing during this time is well illustrated by the numbers. There were 261 races run in the UK in 1762, but by 1849 this had grown to 1307. This spread had also began to reach foreign shores with the French Jockey Club being set up in 1833 and the Australian version in 1840. The variety of racing was added to with the emergence of jumps racing which began in Ireland in the 18th century. This type of racing was traditionally run over distances of up to four and a half miles and featured a variety of obstacles. Due to churches often being used as landmarks to identify the start and end of a course, this racing quickly came to be referred to as steeplechasing. The first such race came in Ireland in the early 19th century. A following soon developed in England with the first Grand National being run in 1839. A lack of organisation resulted in the sport suffering a decline in popularity. This problem was addressed in 1860 with the establishment of the National Hunt Committee. The National Hunt Chase was created and initially moved around courses before settling at Cheltenham. This created a centrepiece for the jumps season, growing over the years into the Cheltenham Festival. The next major step forward for the sport came with the advent of sponsorship money in 1957 when Whitbread first sponsored the Gold Cup. Since the establishment of the racing pattern in 1967, horse racing has continued to grow in popularity. The pattern is essentially a method of ensuring there are a range of high quality races over a variety of distances spread over the course of a season. Meetings such as Royal Ascot and Glorious Goodwood on the flat and the Cheltenham Festival and Aintree Grand National meeting over jumps have become established highlights of the sporting calendar. In terms of spectators, horse racing is second only to football. Fans continue to flock to each of the sixty unique racetracks in the UK. The variety of tracks on offer in Britain has no equal around the world. From the sharp continuous turns at Chester to the straight mile at Doncaster, the flat all weather tracks to the undulating Epsom Downs, Britain has it all. The big races such as The Derby and in particular the Grand National continue to capture the imagination of the general public and these races continues to supply us with genuine sporting superstars. Desert Orchid and Red Rum were horses to capture the nation’s hearts in years gone by, whilst recently we have been privileged to witness the greatest racehorse to ever set foot on the track in the form of Frankel, trained by the late Sir Henry Cecil and now out to stud for those willing to pay more than £100,000 for the privilege! The size and popularity of horse racing today is perhaps best illustrated by the numbers. Around 14,000 racehorses are currently in training, taking part in over 9,000 races each year. The total prize money awarded in these events is regularly in excess of £90m. Close to 20,000 people are in employment as a direct result of racing with another 40,000+ working in the betting industry. Horse racing has been a part of Britain’s sporting fabric for hundreds of years, growing into the large industry we see today. It is to be hoped it can maintain its popularity into the future. It is however not without its problems, both from within and outside of the industry. Trainers and owners alike have long berated the declining prize money on offer, this is a problem which needs to be addressed. Failure to do so will result in an increasing number of unattractive small field races and the related factor of some of our better horses seeking bigger pots on foreign shores. This has been witnessed to some extent with the increasing number of British runners in France where the prize money is much greater. Thankfully steps appear to being taken to address this issue with the recent £18m prize money boost announced late in 2014. The opening of a new course at Chelmsford City in January 2015 can also be taken as a major positive following the recent loss of tracks at Hereford and Folkestone. The other major issue surrounds the wellbeing of the horses themselves, both during and after their racing career. Again the industry has recognised the possible consequences of the negative publicity this may generate. The restrictions placed upon the use of the whip and decreasing the difficulty of the Grand National fences being two examples of how racing is looking to modernise to become more horse-friendly. The ability to generate a unique brand of excitement and provide unforgettable sporting moments are factors in racings favour and these will never change. The governing bodies must continue to work proactively together to ensure future generations are able to enjoy this wonderful sport to the full and we’re confident they will.